Is Time Machine all you need? Editor’s Note: The following article is an excerpt from the recently published Take Control of Easy Backups in Leopard , a $10 electronic book available for download from TidBits Publishing. The 83-page ebook helps readers create a complete Leopard backup system that includes archiving, a bootable duplicate, and offsite backups, with a special emphasis on Time Machine and situations where Time Machine won’t provide the backups you need. You’re going to need one or two external hard drives for your backups. Your local computer store or online retailer likely has hundreds, if not thousands, of hard drives with every imaginable combination of capacity, speed, interface, and case design—plus any of countless bells and whistles. And the selection changes constantly. In this excerpt from Take Control of Easy Backups in Leopard, I show you the most important things to look for when choosing a drive and help you to cut through some of the confusion. The most important consideration in a backup drive, by far, is its capacity—how many gigabytes of data it will hold. In general, the bigger, the better. In fact, I could simply say to get the largest hard drive you can afford, and that would be a reasonable rule of thumb. However, if you can’t afford an especially large drive, or if the amount of data you have to back up is exceptionally large, you may want a bit more guidance. So figure out the size you’ll need for duplicates, then the size you’ll need for archives, and finally the total size to look for. Duplicate size You’ll store, on part of your external hard drive, an exact, bootable copy of your Mac’s regular startup volume. But the volume that stores your duplicate need only be as large as the amount of data on your startup volume, not necessarily the whole disk. For example, if your Mac came with a 500GB hard drive but you’ve filled up only 100GB of that space, you can fit a duplicate on a 100GB disk or partition. Over time, though, you’ll add more files to your Mac, so if you cut it that close, you’ll soon outgrow your backup drive. Therefore, I suggest that you allot at least one and a half times the amount of space currently occupied on your startup volume for a duplicate. 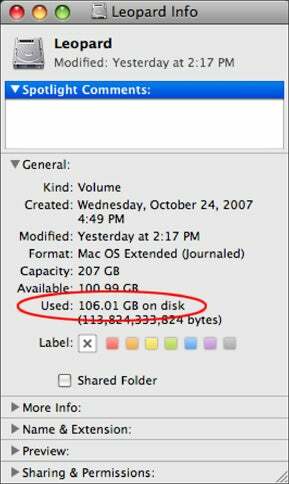 So if you’ve got 100GB of data on your drive, you want (at least) 150GB for your duplicate. More, of course, is perfectly fine—and will give you even more room to grow. To find out how much space is occupied on your hard disk, select it and choose File -&gt; Get Info. The number next to “Used” is the one you care about. To find out how much space on your startup volume is being used, select the icon for your disk in the sidebar of any Finder window. Then press Command-I to display the Info Window. The number next to “Used” is the amount of space currently occupied on the disk. Archive size Time Machine requires your destination drive to have, as a bare minimum, 1.2 times the space occupied by the data you’re backing up. (That gives some extra space to store multiple versions of at least some files.) So, as a first pass, multiply the figure you see in the screenshot to right to find out the smallest partition size Time Machine can use. That figure could go up or down, however. If you decide not to let Time Machine back up absolutely everything on your disk, then it won’t need so much space. Conversely, if you let Time Machine back up more than one volume (such as the contents of a second internal drive), it’ll need 1.2 times the combined space occupied by the data on all those volumes. In any case, I must emphasize that 1.2 times is an absolute rock-bottom minimum. You’ll be far better off setting aside 1.5 times, 2 times, or even 3 times the amount of space used on your disk for backups. The reason is simple: the more space Time Machine has to work with on the destination drive, the more backups it can store—and the farther back in time you can reach when it comes time to restore data. What if you’re not using Time Machine? Well, the general principle still holds that you’ll want more free space than is currently occupied on your drive, with a bit of a cushion. But a twist is that most other backup software offers compression, which makes your files take up less space on the backup drive than they otherwise would. So, for most people, having free space equal to 1.5 times the amount of data on the startup volume should be adequate. Total size Your duplicate and archives will live on the same physical disk, so you must now add those two numbers together. So, if you have 100GB worth of data, you might choose to allot 150GB for a duplicate and another 150GB for archives, bringing the total to a tidy 300GB. That means: look for a 300GB or larger-capacity drive. (Although 300GB drives exist, you may find 320GB drives to be more common.) But also consider the next-larger size, which is typically 500GB. If the cost difference is small, as it probably will be, you’ll be glad for that extra capacity later on. You can use a single drive to back up more than one Mac. And if you have two or three Macs (give or take) running Leopard, each with only a modest amount of data to back up, combining backups on a single drive makes sense. Be sure to calculate the space needed (for both duplicates and archives) for all the Macs you intend to back up and add them together before deciding which drive to buy. But what if no drive is large enough, even for backing up a single Mac? Let’s say you have an iMac with a 1TB disk, of which 800 GB is used. You’d want, ideally, at least 1.2TB of space each for a duplicate and archives. As I write this, the highest-capacity individual drive mechanisms commercially available hold just 1TB each, though you can buy enclosures with two or more mechanisms in one unit (sometimes removable, sometimes not) for a total capacity of 2TB or more. Make do with the biggest drives you can get, and simply do without the extra “breathing room” (which may mean restricting which files are included in your archives). Use RAID (redundant array of independent disks) hardware or software to build a larger volume out of multiple individual drives. Get separate drives for duplicates and archives. In any case, you’re going to be laying out some significant money for your backup drives, and I just want to say that I feel your pain. But remember: the pain of losing your valuable data would be greater! Sweet spot: At the moment, the best values (cost per gigabyte) are to be had on drives in the range of 500GB to 1TB (terabyte). With some research, you should be able to find a 500GB external drive for under $150, and a 1TB drive for under $350. But prices vary according to several factors, including which interface(s) the drive has. Your hard drive will connect to your Macitntosh using one of several interfaces. For all practical purposes, only four possibilities are worth considering: FireWire 400, FireWire 800, USB 2.0, and eSATA (external SATA). You can buy hard drives with one, two, three, or all four of these interfaces. In general, drives with a single interface are less expensive than drives with more than one, and as single-interface drives go, USB 2.0 drives are usually the cheapest. However, money isn’t the only consideration. Hardware support: With the exception of the just-released MacBook Air, every Mac that can run Leopard has at least one FireWire 400 port; most also have one or more USB 2.0 ports. Many, but not all, have FireWire 800 ports. As of late 2007, no Macs include eSATA ports, though you can add them using a PCI or PCI-X card (for Power Mac and Mac Pro models), a PC card (for PowerBooks), or an ExpressCard 34 (for MacBook Pros). You’ll have to decide whether the extra speed boost is worth the cost of the adapter (and, perhaps, a more-expensive drive). Bootability: Again, apart from the MacBook Air, every Mac that can run Leopard can boot from an external FireWire drive (that’s FireWire 400, FireWire 800, or both, depending on which ports the computer has). But only an Intel-based Mac can boot from a USB 2.0 drive. (Well, there are a few odd exceptions to this rule, in some cases involving some complex command-line hacking, but let’s just say it usually doesn’t work, and certainly isn’t officially supported.) Therefore, if you have a PowerPC-based Mac, or both types, FireWire is a better choice than USB 2.0 As for eSATA, only a few of the Macintosh-compatible adapters currently support booting from an eSATA drive, though that situation could change in the future. Flexibility: Numerous other devices, such as the AirPort Extreme base station, third-party wireless access points, and NAS devices (not to mention Windows PCs), have USB 2.0 ports—but usually not FireWire or eSATA ports—to which you can attach an external drive. Even though, at present, Time Machine doesn’t work with such devices, perhaps it will in the future (though if you’re not planning to use Time Machine anyway, it’s irrelevant). And you may wish to use your backup drive for more than one purpose. So what’s the bottom line? You can’t go wrong with a quad-interface drive, which has all four options—it’ll give you maximum compatibility and flexibility now and into the foreseeable future. It may cost a bit extra, though. Since eSATA is still relatively uncommon on Macs, and less flexible, my second choice would be a FireWire 400/FireWire 800/USB 2.0 drive. If I had to choose just two interfaces, I’d pick USB 2.0 along with FireWire 800 if all my Macs have a FireWire 800 port, or FireWire 400 if they don’t. And finally, if I had to narrow the choice down to just one interface, I’d choose the fastest version of FireWire my computers support. I’d consider a USB 2.0 drive, without other interfaces, only if I were backing up exclusively Intel-based Macs and had very strict budget limitations. Once you’ve figured out the capacity and interface(s) you’re looking for, the next consideration is cost. In fact, for all practical purposes, that’s the only other consideration. Hard drive manufacturers and retailers will try to tempt (or confuse) you with a long list of other specifications and features: rotational speed, seek time, buffer capacity, extra buttons, fancy cases, and so on. When you’re using a drive for backups, these things matter so little in real life that you shouldn’t worry about them at all. Seriously. Get a drive with enough capacity, with the right interface, at the right cost, and you’re golden. Let me refine that just slightly. If you’re looking at two drives with the same capacity and the same interfaces at nearly the same price, then sure, choose the drive with the faster rotation (say, 7,200-rpm instead of 5,400-rpm) or the longer warranty. But please don’t pay extra money for things like buttons, lights, and hot-swap enclosures. In my experience, these things simply aren’t worth it for backups. Two features, however, may be worth paying extra for. The first is hardware encryption. A few hard drives offer built-in hardware encryption that protects everything written to the disk without relying on your computer or software to do any of the work. Some of these drives have a special electronic key that you use to unlock them; others use a fingerprint scanner. Hardware-encrypted drives allow both your Time Machine archives and your bootable duplicate to be fully protected from prying eyes, and that’s nothing to sneeze at. But be aware that you’ll pay more for such drives, and you’ll have fewer choices of interface and other features. The second feature that may be worth extra money to you is a smaller enclosure. If you spend a lot of time on the road, you’ll appreciate the extra portability of a 2.5-inch drive—especially if you get one that can draw power from a FireWire or USB port without requiring a separate AC adapter. But be aware that not only are these drives more expensive, they have a smaller maximum capacity—at publication time, the largest 2.5-inch drive I could find held only 320GB.